The process is fairly easy. 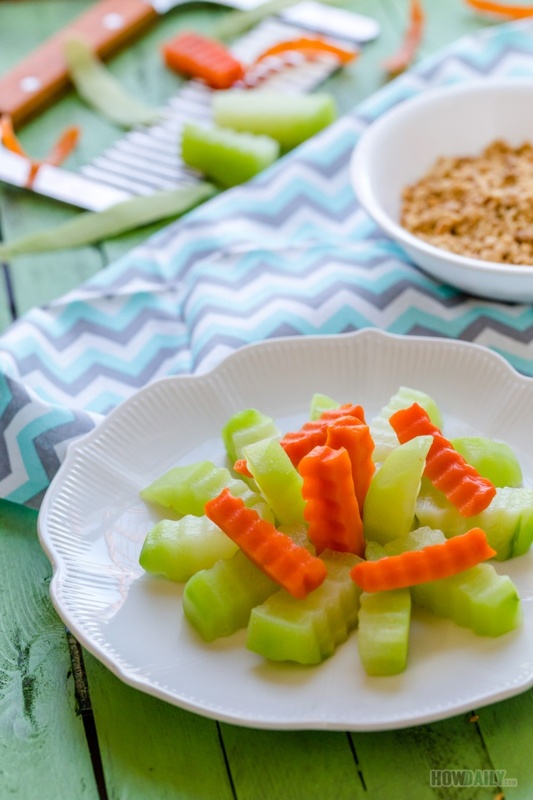 You peel, clean and cut a young chayote squash and carrot into desired shape and size. Carving flower or any decoration would work perfectly too if you’re packing that bento box, or just want to show off a little. Just remember to pick a younger chayote squash to avoid too many skin and chewy texture. 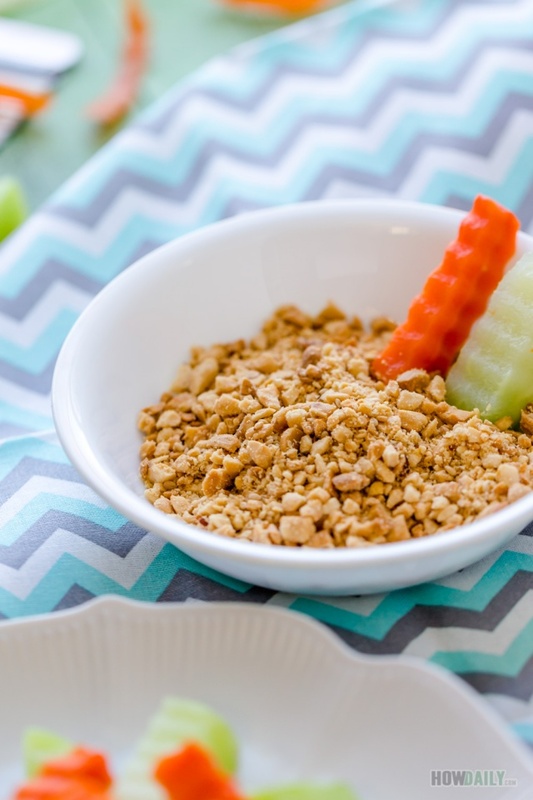 Crushed peanut is just a mix of crushed roasted peanut with some white sesame and a little bit of salt. Some would add ground pepper, but that would be entirely up to you. Any how, enjoy this easy side along with your protein. Nice for those who on weight control or vegetarian too. Substitute with cashew if you are allergic to peanut. Peel the skin off chayote squash and carrot, wash and rinse them both repeatedly. Rub the chayote squash to remove all gooey, then wash and rinse. Cut into prefer bite size chunks. Bring a pot of water to boil, add a teaspoon or so of sea salt. When boil, add carrot chunks then wait about 2-3 minutes later to add chayote chunks. After 5 minutes, remove pot from heat and transfer to an icy cold water bath to quickly chill. Discard/drain off the water. 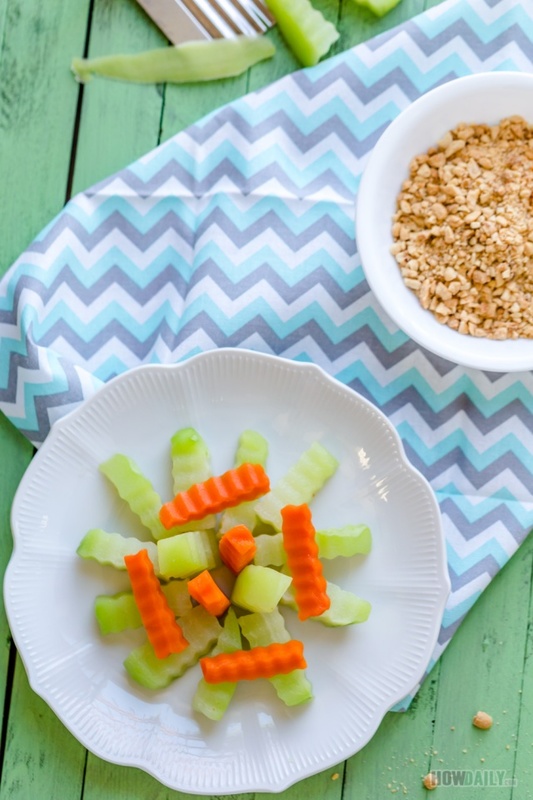 Serve these boiled chayote squash and carrot along with some crushed peanut as dipping. Get some unsalted roasted peanut and crush them: use the bottom of a pot or pound them with a mallet. In a dry container, add crushed peanut, roasted sesame and some sea salt. This easy mixture can be used as dipping for boiled/steamed vegetable or over plain cooked rice.